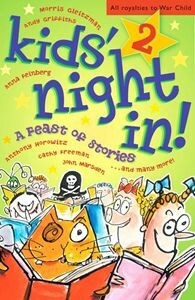 This is a follow up to Kids Night In One and is made up of short stories and illustrations by well-known Australian authors. All the proceeds from the sale of this book goes to the War Child Fund which helps children in war-torn countries like Afghanistan, Sudan and Bosnia. My contribution to the book is a Chinese Horoscope. So if you would like to find out what animal sign you are, take a browse or better still, buy a copy, it’s for a really worthwhile cause.